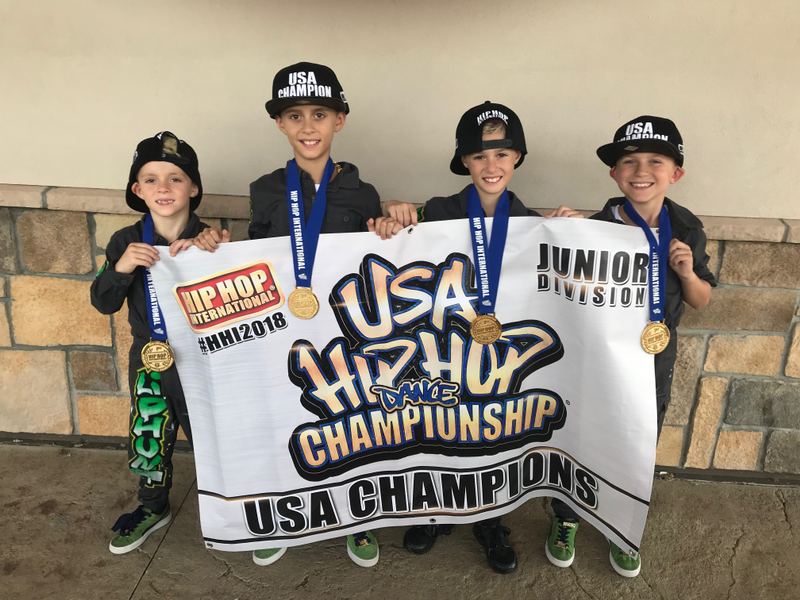 From left, Aaron Connor, Dante Graziano, Matteo Graziano and Giacinto Graziano are members of Lil Phunk, the Junior Division National Hip Hop Dance Champions. Let’s be honest. when you think of ‘Hip-Hop’, Tewksbury isn’t up there with Atlanta, NYC and LA among the hot spots. But thanks to a trio of young brothers, that may soon change.Dante, Matteo and Giacinto Graziano are members of the dance team “Lil Phunk”, which trains at and competes out of the Phunk Phenomenon Dance Complex in Everett. The 50-member squad is also the Junior Dance team for the Boston Celtics, performing at home games, several times a year.Last month, nine members of the Lil Phunk team (ages 7-12) won the gold medal and U.S. National Championship in the Junior Division at the 2018 Hip Hop Dance Championship Competition in Phoenix, AZ. With the victory, the squad advanced to the World Hip Hop Dance Championships, that same week, placing 6th. In addition, the members of Lil Phunk were part of the Phunk Phenomenon 33-person team that won the Bronze Medal in the “Mega Crew” Division at the same competition. Briggs-Connor opened Phunk Phenomenon in 2002 and has entered teams in the Hip-Hop International competitions for the past nine years. The Graziano brothers, sons of Andrea and David Graziano, have been dancing for almost as long as they have been walking. For Giacinto, 7, Dante, 11 and Matteo, 9 being part of a dance team gives them a chance to show off their skills and athleticism, as well as feed their competitive fires. “I like competing, I think it’s fun,” said Dante. The boys keep in touch with their friends/competitors in the dance community throughout the year via social media, as the dancers will follow each other’s Instagram and Snapchat accounts. As part of Lil Phunk, the Graziano brothers have competed in many competitions against top flight teams. But the field at the 2018 Nationals was especially tough and they knew they would have their work cut out for them. “We saw the teams that went before us and then the ones that went after us and thought, wow, this is gonna be tough,” said Dante. As the results were announced, dancers, coaches and parents were all on pins and needles. Even when the names of the 3rd place and 2nd place teams were read off, Lil Phunk still wasn’t sure of their fate. But when the team was announced as Junior Division National Champions, they let out a tidal wave of emotions. But Lil Phunk wasn’t done competing, joining with the teens and adults of Phunk Phenomenon in the “Mega Crew” and helping the team win the Bronze. For the Graziano brothers and the other members of Lil Phunk, competing alongside the adults is challenging and means extra practices and some late nights. “It’s hard because they’re more advanced than us,” said Dante. “We put a lot of work in,” said Giacinto. The brothers practice schedule extends beyond Phunk Phenomenon. They dance locally at Dance Expressions, a Tewksbury studio owned by their aunt, as well as tumbling with ECE and being part of a break dancing crew at a studio in Cambridge. “We have something going on every day,” said Matteo. Beyond medals and beyond fame, Lil Phunk and Phunk Phenomenon use dance as a platform to spread awareness about San Filippo Syndrome, a rare genetic disease that effects the brain. Jared Connor, Briggs-Connor’s older son, has the disease. He is her inspiration and has become an inspiration for the entire Phunk Phenomenon team. At the Hip Hop Dance Championship Competition, Dante Graziano had the chance to take the microphone and tell people about Jared and about San Filippo Syndrome. For Lil Phunk and the Graziano brothers, the beat goes on.